Giftcoin is a cryptocurrency that will be used for donations. 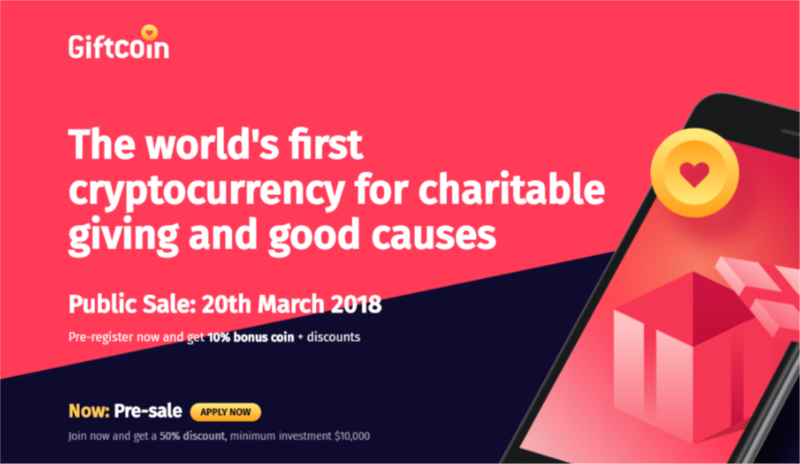 The key goal of the developers of the coin is to help those in need using blockchain technology, which makes it easier for people to make donations. Giftcoin offers more than an opportunity for users to donate. It also provides a wide selection of charitable organizations where one can donate. Additionally, the platform tracks the donations, ensuring that it has reached its intended recipients. The goal of the platform is to come up with a system that is completely transparent and free, starting from the donors to charitable organizations. This means that any transaction carried out on Giftcoin is free. However, to ensure the sustainability of the platform after the offering of the Giftcoin tokens, a small fee of $1 will be charged for converting fiat currency to Giftcoin. This will encourage users to use the system to give donations. Users who wish to donate via the platform have to download the Giftcoin e-wallet and link it to their bank account. The user further configures the app and chooses the maximum amount of Giftcoin he or she wishes to buy monthly. Every time you purchase something, the Giftcoin round-up app converts your payment to the nearest dollar. The difference is stored in your e-wallet in the form of Giftcoins. After you have accumulated enough Giftcoins in your wallet, you can donate them to the charity of your choice. The use of smart contracts allows for transparency and donors will get to know who receives the donations. This will encourage others to donate. The platform also enables users to automate their e-wallet such that they will only release money to selected causes. The rounding-off of small fractions of money and accumulating the funds is a great and convenient way to donate. Everyone can donate, as no large amounts of money is needed. Giftcoin is a cryptocurrency that needs to be stored in secure wallets. Users of Giftcoin should download a secure e-wallet first and keep the bought coins in it. Users who participate in the ICO can earn the digital coins, but they must meet some requirements. Those wishing to invest in the platform can register for an upcoming ICO and acquire GIFT tokens using Ethereum or Bitcoin. The value of the gift coin is set at 900 GIFT tokens= 1 Ethereum. Are you interested in charity? Do you think this is the right investment for you? Let us know your take in the comment section below.